Australian rapper Iggy Azalea took to the red carpet in a figure-hugging, cobalt Armani Privé gown and, um, a rather odd choice in hair-wear. The star rocked a milkmaid-meets-crown braid that didn’t quite do it for us, mainly because it gave Iggy makeshift helmet head. Seriously, the star’s normally cascading blond locks would have been a better counterbalance for her structured Armani dress, but we can at least give it to Iggy for trying a new, unexpected look. 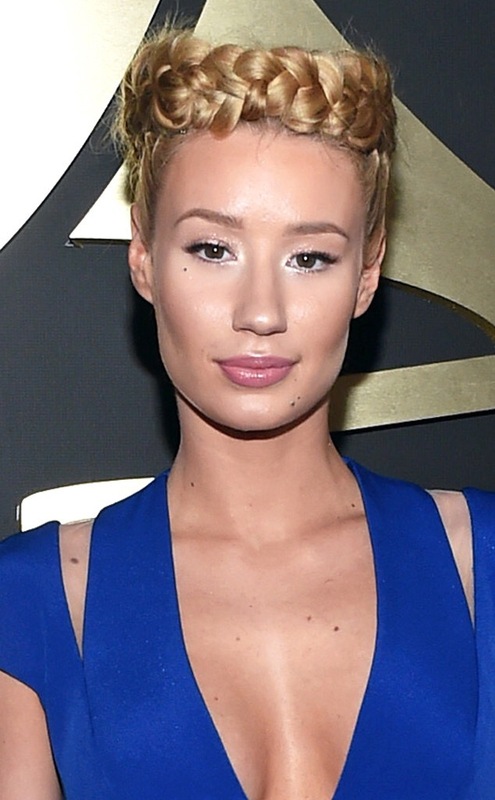 Hairmet aside, the star took another loss tonight: Iggy is not, we repeat, not the Grammy winner for Best Rap Album. Twitter users sounded off on the rapper’s loss, with most expressing relief that Eminem nabbed the award instead. Someone paid a couple dollas and da check bounced!!!! LOL!!! They’re coming for rap and RnB like jazz and rocknroll. Its happening. Hell i believe they already got RnB. Pres. Obama Wins the FINAL Debate!